With our democracy in crisis, many Americans are frightened and uncertain. So, the legendary activist Frances Moore Lappé, and organizer-scholar Adam Eichen teamed up to tell the underreported story of a “movement of movements” arising to tackle the roots of the crisis. To save the democracy we thought we had, argue the authors, we must take our civic life to a place it’s never been. 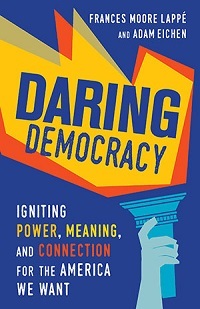 The arising democracy movement’s innovative and inspiring strategies are enabling millions of Americans to feel part of something big, historic, and positive.